Travelling seems to be getting more expensive with each passing day. Alongside ever increasing fares, another area of concern is the tight restrictions on the amount/weight of luggage you can carry both in the hold and as hand baggage. Plus there are restrictions on the dimensions of the luggage pieces as well. Finding the right piece of luggage is invariably important and this is where CabinZero comes into the picture. CabinZero make high quality and durable bags that are slightly smaller than the specified dimensions of hand baggage in most airlines making them perfect for travellers using budget airlines. These bags also work perfectly well for everyday use and for backpacking. We at DB Reviews got the opportunity to test out the CabinZero Classic Ultra-Light Cabin Bag. The bag accompanied us on a couple of holidays recently and I thought now is the best time to share my views on CabinZero with all of you. With a large 44 litre capacity, the bag is fully lined and has a main compartment that is lockable. 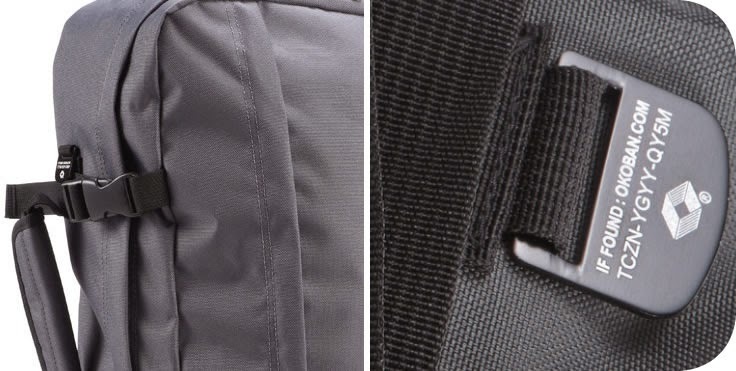 It also has a front zipped pocket, an inside zipped pocket and a mesh pocket(within the main compartment). The bag has both top and side handles and compression straps on the sides which according to me is a well thought of feature. The best part though is the weight of the bag which is 760gms approximately. Yes, it's less than a kilogram. This makes the bag very light-weight. Combine that with the rectangular shape and you have a bag that will not only fit easily in into an airplanes overhead locker but also allows you to maximise the amount of stuff you can pack. Understandably the CabinZero does not have wheels and a pull along handle. Addition of these features would have increased the overall weight of the empty bag and also reduced the storage space. So you either carry CabinZero like a suitcase or as a backpack. The shoulder straps are adjustable and padded making it comfortable to wear. Mr.H wore it as a backpack on all the occasions we travelled with CabinZero and he said it was very comfortable. The light-weight nature of the bag is a HUGE plus point we both felt. CabinZero also comes with a free Okoban Global Luggage Tracker service. Okoban is a FREE global lost and found registration service that offers protection against lost luggage. All you need to do is register your luggages unique identification code online. In case your luggage is lost while travelling, the Okoban tracker will help locate your luggage and will send you an immediate notification about the location of your bag and how to get it back. Cool, isn't it? Like I mentioned earlier in the post, the bag has been with us on a couple of holidays and has made our travelling a more enjoyable experience. Overall, CabinZero is a very practical, functional and stylish cabin bag. It is durable and strong in spite of being lightweight. We are mightily impressed with the CabinZero. CabinZero comes in a range of trendy colours and can be ordered online at the CabinZero Shop. This really looks like a handy product to own! Love the orange chill colour, so distinctive and cool!